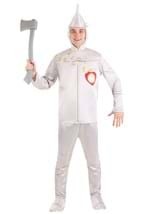 Complete any Tin Man costume with this red plastic heart. The heart measures at 5' x 4' and has a clock image in the center(clock does not actually tick). A silver metal chain is connected to the top of the heart and also has a safety pin. Complete your Tin Man look with our silver makeup and wood axe!